Despite improvements in censuses and household surveys, the building blocks of national statistical systems in sub-Saharan Africa remain weak. Measurement of fundamentals such as births and deaths, growth and poverty, taxes and trade, land and the environment, and sickness, schooling, and safety is shaky at best. The challenges are fourfold: (1) national statistics offices have limited independence and unstable budgets, (2) misaligned incentives encourage the production of inaccurate data, (3) donor priorities dominate national priorities, and (4) access to and usability of data are limited. The Data for African Development Working Group’s recommendations for reaping the benefits of a data revolution in Africa fall into three categories: (1) fund more and fund differently, (2) build institutions that can produce accurate, unbiased data, and (3) prioritize the core attributes of data building blocks. This brief is based on the Data for African Development Working Group report, a joint effort of the African Health and Population Research Center and the Center for Global Development. The report is authored by Amanda Glassman, Alex Ezeh, Kate McQueston, Jessica Brinton, and Jenny Ottenhoff. Governments, international institutions, and donors need good data on basic development metrics to plan, budget, and evaluate their activities. To be valuable, such data must be accurate, timely, disaggregated, and widely available. Statistical systems that work to improve policy and enhance accountability allow all stakeholders to freely exchange high-quality data to ensure that funding and development efforts are working. 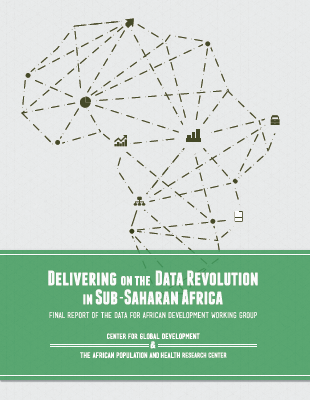 Nowhere is the need for better data more urgent than in sub-Saharan Africa. The building blocks of national statistical systems in sub-Saharan Africa remain weak. Estimates of poverty represent robust statistics for only 39 countries for which we have internationally comparable estimates [in 2005]. And they are not even comparable over the same year. Only 11 African countries have comparable data for the same year. For the others, we need to extrapolate to 2005, sometimes (as in the case of Botswana) from as far back as 1993. The nascent post-2015 UN development agenda is generating momentum for a worldwide data revolution and is highlighting the need for better development data in Africa and elsewhere. But the early efforts focused on collecting more data, not necessarily better data, may divert attention from the underlying problems surrounding the production, analysis, and use of basic data that have inhibited progress so far. Often these problems are not merely technical but the result of implicit and explicit incentives and systemic challenges. Both donors and countries need take truly revolutionary steps to address the core problems underlying bad data in the region. National statistics offices have limited independence and unstable budgets. Misaligned incentives encourage the production of inaccurate data. Donor priorities dominate national priorities. Access to and usability of data are limited. All challenges must be addressed to make progress. National statistics offices (NSOs) are the backbone of data production and management in most African countries; they produce official statistics and support data activities at other national agencies to create accurate and timely data for decision making. NSOs must be able to produce reliable, accurate, and unbiased statistics that are protected from outside influence. Most NSOs in Africa, however, are constrained by budget instability and a lack of autonomy that leave them vulnerable to political and interest-group pressures. Indeed, budget limitations and constraints on capacity are two of the most frequently cited reasons for lack of progress on statistical capacity in sub-Saharan African countries. Of the 54 member countries of the African Union, only 12 are considered to have an autonomous NSO according to Regional Strategic Framework for Statistical Capacity Building in Africa (2010). In the remaining 41 countries, statistics fall under the jurisdiction of another government ministry. NSOs that lack autonomy often do not manage their own budgets and receive little government funding. They must therefore rely on donors to fulfill even their most basic functions. In many countries, nearly all core data collection activities are funded primarily by external sources. Without functional autonomy and predictable national funding of NSOs, other efforts to address data systems challenges in Africa are not likely to succeed. Discrepancies between administrative data and household survey-based estimates in education, agriculture, health, and poverty mean that many internationally published numbers are inaccurate. In many low-income countries, for example, local units have an incentive to exaggerate school enrollment when central government and outside funders connect data to financing. It is hard to insulate data from politics. The development of intrinsic and extrinsic checks can systematically avoid the resulting data inaccuracies. It’s hard to insulate data from politics — explicit quality checks can help avoid inaccurate data. These and other challenges related to incentives and funding are often rooted in conflicting objectives between donors and countries. International donors use data to inform allocation decisions across countries while governments use data to make budgetary decisions at more micro levels. Similar tensions also exist within countries, between the national and local levels of government. This difference affects the demand for and use of data. In some African countries, it contributes to inaccuracies in the data published by national and international agencies. Donors routinely spend millions for micro-oriented survey fieldwork and one-off impact evaluations. These ad hoc donor-funded projects generate significant revenue for statistics offices and individual NSO staff. Increasing take-home pay by chasing donor-funded per diems via workshop attendance, training, and survey fieldwork is the order of the day. As a result, statistical systems lack incentives to improve national statistics capacity or prioritize national data building blocks, leaving core statistical products such as vital statistics and land registries uncollected for years. More open data is needed to improve or inform policies and to hold governments and donors accountable. Even the best, most accurate data is useless if it is not accessible to governments, policymakers, civil society, and others in a usable format. Many NSOs and other government departments are hesitant to publish their data, lack the capacity to publish and manage data according to international best practices, or do not understand what data users want and how to get that information to them. These problems are critical because more open data is required to improve or inform policies and to hold governments and donors accountable. Action around a data revolution in Africa should begin by addressing the underlying problems surrounding the building blocks of national statistical systems, including their production, analysis, and use. These changes must be initiated and led inside governments, but donors and local civil-society groups also have a major role to play. The data revolution must help modify the relationship between donors, governments, and the producers of statistics and work in harmony with national statistical priorities. The data revolution must help modify the relationship between donors, govs, & producers of statistics. The following recommendations for action directly address one or more of the problems outlined here. Taken together, they can help build a solid foundation for a true data revolution that can be led and sustained in the region. Reduce donor dependency and fund NSO more from national budgets. African governments should allocate more domestic funding to their NSO and statistical systems to smooth spending, maintain teams, and enhance independence. Ideally, governments would allocate a significant share of the required funding barring unusual fiscal or other demands in a particular year. Where more creative mechanisms are needed, governments might consider routine allocation of a share of sectoral spending to be tied to national strategies for the development of statistics (NSDS) activities—1 percent for data, for example, or a “data surcharge” added to any donor project to fund the public good of data building blocks. A “data compact” could help create incentives for greater progress and investment in good data. Mobilize more donor funding through government-donor compacts and experiment with pay-for-performance agreements. Governments should press for more donor funding of national statistical systems, using a funding modality, or data compact, that creates incentives for greater progress and investment in good data. A pay-for-performance agreement could link funding directly to progress on improving the coverage, accuracy, and openness of core statistical products. Demonstrate the value of building block statistics by generating high-level agreement by national governments and donors to prioritize national statistical systems and the principles for their support. Efforts may also include greater support to civil society to elevate the importance of national statistics and hold policy makers accountable for progress. Enhance functional autonomy such that NSOs function independently of government sectoral ministries and are given greater independence from political influence. These efforts, as well as those to operationalize legislation already in existence, should be increasingly supported through existing programs and initiatives to support statistical capacity. Experiment with new institutional models, such as public-private partnerships or crowdsourcing to collect hard-to-obtain data or outsource data collection activities. Such models would support increased functional and financial autonomy while retaining, if not increasing, NSO accountability to stakeholders. Public-private partnerships in high-income countries have been shown to generate demand and increase access to open data. Although 80 percent of African countries conducted a census in the past decade, Africa still invests too little in the building blocks of data, and in some cases political economy challenges distort the data. Future efforts should prioritize funding and technical assistance to strengthen the core attributes of data building blocks. Build quality control mechanisms into data collection to improve accuracy. Many of the challenges relating to misaligned incentives can be mitigated by having NSOs provide support, oversight, and quality control over data collection and analysis from other government agencies. The sectoral assessment framework of Stats South Africa, for example, provides improvement plans for government agencies and departments that produce data and evaluates data quality on a number of indicators. Better use of technology may also help address this issue. Encourage open data. National governments and donors should release all non-confidential, publishable data, including meta-data, in a machine-readable, analysis-ready format. The African Development Bank and World Bank should expand their lending to support statistical capacity building and leverage open data policies. Monitor progress and generate accountability. Civil society organizations, including think tanks, and nongovernmental organizations should monitor the progress of both donors and governments in improving data quality and evaluating for discrepancies — and hold both accountable for results. CGD is grateful to the Omidyar Network, the UK Department for International Development, and the Hewlett Foundation for support of this work. This research was also made possible through the generous core funding to APHRC by the William and Flora Hewlett Foundation and the Swedish International Development Agency. More than 80 percent of countries in Africa conducted a census between 2005 and 2014, according to the UN Stats (http://bit.ly/UGezKV). For an evaluation of the International Household Survey Network and Accelerated Data Program, see Anne Thomson, Graham Eele, and Felix Schmieding, Independent Evaluation of the International Household Survey Network (IHSN) and Accelerated Data Program (ADP), (Oxford: Oxford Policy Management, 2013), http://bit.ly/1nzzpDT. Shanta Devarajan, “Africa’s Statistical Tragedy,” Africa Can End Poverty Blog, October 6, 2011, http://bit.ly/1pxSR5g. The 12 countries are Angola, Burkina Faso, Cape Verde, Chad, Egypt, Ethiopia, Liberia, Mauritius, Mozambique, Rwanda, Tanzania, and Uganda. Morten Jerven, Poor Numbers: How We Are Misled by African Development Statistics and What to Do about It (Ithaca, NY: Cornell University Press, 2013). Lynn Woolfrey, “Leveraging Data in African Countries: Curating Government Microdata for Research,” DataFirst Technical Paper 22, University of Cape Town, 2013, http://bit.ly/1iBMMWx. Joel Gurin, “Report from London’s Open Data Institute,” OpenData Now (blog), July 26, 2013, http://bit.ly/1yJDcWF. Pali Lehohla, South African Statistical Quality Assessment Framework (SASQAF) Operational Standards and Guidelines (Pretoria, South Africa: Statistics South Africa, 2010). http://bit.ly/1rubPLc. Malgré les améliorations apportées aux recensements et aux enquêtes effectuées auprès des ménages, les éléments constitutifs des systèmes statistiques nationaux en Afrique subsaharienne demeurent insuffisants. Les mesures de données fondamentales, telles que les naissances et les décès, la croissance et la pauvreté, les impôts et le commerce, les terres et l’environnement, ainsi que la maladie, la scolarisation et la sécurité, laissent tout au plus à désirer. Il y a quatre catégories de défis à surmonter : (1) les instituts nationaux de statistiques jouissent d’une indépendance limitée et de budgets instables, (2) l’existence d’incitations divergentes encourage la production de données inexactes, (3) les priorités des bailleurs de fonds ont préséance sur les priorités nationales et (4) l’accès aux données et leur utilité sont limités. Le groupe de travail sur les Données pour le développement africain a formulé des recommandations sur la manière de tirer profit d’une révolution des données en Afrique, lesquelles se répartissent dans trois catégories : (1) financer davantage et financer différemment, (2) créer des institutions capables de produire des données exactes, non biaisées et (3) classer par ordre de priorité les attributs essentiels des éléments constitutifs des données. Cette fiche se fonde sur le rapport du groupe de travail sur les Données pour le développement africain, fruit d’un effort collectif entre le Centre africain de recherches sur la population et la santé et le Center for Global Development. Les auteurs du rapport sont Amanda Glassman, Alex Ezeh, Kate McQueston, Jessica Brinton et Jenny Ottenhoff. Pourquoi des données, pourquoi maintenant ? Les gouvernements, les institutions internationales et les bailleurs de fonds ont besoin de données fiables sur les mesures de base du développement pour pouvoir planifier, établir leur budget et évaluer leurs activités. Pour être valables, ces données doivent être exactes, à jour, non regroupées et largement disponibles. Les systèmes statistiques qui ont pour effet d’améliorer les politiques et de renforcer la responsabilisation permettent à toutes les parties prenantes d’échanger librement des données de haute qualité afin d’assurer que les efforts en matière de financement et de développement sont efficaces. Nulle part ailleurs qu’en Afrique subsaharienne, le besoin de disposer de données de meilleure qualité ne se fait sentir avec autant d’urgence. Les estimations de la pauvreté reposent sur des statistiques solides pour seulement 39 pays, pour lesquels nous disposons d’estimations comparables au plan international [en 2005]. Et elles ne peuvent même pas être comparées au cours de la même année. Seul 11 pays africains disposent de données comparables pour la même année. En ce qui concerne les autres, nous devons extrapoler à partir de l’année 2005, parfois même (c’est le cas du Botswana) remonter aussi loin que 1993. Le nouveau programme d’action de l’ONU en faveur du développement au-delà de 2015 suscite une dynamique en faveur d’une révolution des données à l’échelle mondiale et met en valeur le besoin de données de meilleure qualité sur le développement en Afrique et ailleurs. Mais les premiers efforts, qui portaient sur la collecte d’une plus grande quantité de données, pas nécessairement des données de meilleure qualité, risquent de détourner l’attention des problèmes entourant la production, l’analyse et l’utilisation de données de base qui ont jusqu’ici empêché tout progrès. Il arrive souvent que ces problèmes ne soient pas purement techniques, mais la conséquence d’incitations implicites et explicites et de problèmes systémiques. Les bailleurs de fonds et les pays doivent prendre des mesures réellement révolutionnaires pour s’attaquer aux problèmes de fond qui sous-tendent la mauvaise qualité des données dans la région. Les instituts nationaux de statistiques jouissent d’une indépendance limitée et de budgets instables. L’existence d’incitations divergentes encourage la production de données inexactes. Les priorités des bailleurs de fonds ont préséance sur les priorités nationales. L’accès aux données et leur utilité sont limités. Les instituts nationaux de statistiques (INS) constituent la base de la production et de la gestion des données dans la plupart des pays africains ; ils établissent les statistiques officielles et soutiennent les activités statistiques dans d’autres organismes nationaux, de manière à fournir des données exactes et opportunes pour la prise de décisions. Les INS doivent être capables de fournir des statistiques fiables, exactes et non biaisées, protégées de toute influence extérieure. Mais en Afrique, les INS sont pour la plupart limités par l’instabilité budgétaire et le manque d’autonomie qui les rendent vulnérables aux pressions exercées par les groupes politiques ou groupes d’intérêts. D’ailleurs, les limitations budgétaires et les contraintes pesant sur les capacités sont deux des raisons les plus souvent citées pour le manque de progrès en matière de capacités statistiques dans les pays d’Afrique subsaharienne. Sur les 54 pays membres de l’Union africaine, 12 seulement sont considérés comme ayant un INS autonome, d’après le Cadre stratégique régional pour le renforcement de la capacité statistique en Afrique (2010). Dans les 41 pays restants, les statistiques relèvent de l’autorité d’un autre ministère. Les INS qui sont dépourvus d’autonomie ne gèrent souvent pas leur propre budget et reçoivent peu de fonds publics. C’est pourquoi ils comptent sur les bailleurs de fonds pour pouvoir s’acquitter de leurs fonctions, même les plus élémentaires. Dans de nombreux pays, presque toutes les activités de collecte des données de base sont financées principalement par des sources extérieures. Sans un INS pourvu d’autonomie fonctionnelle et d’un financement national prévisible, les autres efforts visant à résoudre les défis posés aux systèmes de données en Afrique n’ont aucune chance d’aboutir. L’existence d’écarts entre les données administratives et les estimations basées sur les enquêtes auprès des ménages dans les domaines de l’éducation, l’agriculture, la santé et la pauvreté signifie que beaucoup de chiffres publiés au niveau international sont inexacts. Ainsi, dans un grand nombre de pays à faible revenu, les bureaux locaux sont incités à exagérer le taux d’inscription scolaire si le gouvernement central et les bailleurs de fonds externes lient le financement aux données. Il est difficile de protéger les données des interférences politiques. L’élaboration de contrôles intrinsèques et extrinsèques peut permettre d’éviter systématiquement les inexactitudes consécutives. Ces problèmes, ainsi que d’autres difficultés liées aux mesures d’incitation et au financement, sont souvent causés par des objectifs contradictoires entre les bailleurs de fonds et les pays. Les bailleurs de fonds internationaux utilisent les données pour renseigner leurs décisions d’allocations sur plusieurs pays, tandis que les gouvernements s’en servent au moment de prendre des décisions budgétaires à des niveaux plus micro-économiques. Des tensions similaires existent également au sein des pays, entre les niveaux national et local des gouvernements. Cette différence a une incidence sur la demande et l’utilisation des données. Dans certains pays africains, elle contribue à des inexactitudes entre les données publiées par les agences nationales et internationales. Les bailleurs de fonds ont l’habitude de dépenser des millions pour des micro-enquêtes sur le terrain et des évaluations d’impacts ponctuelles. Ces projets ad hoc financés par les donateurs génèrent d’importants revenus pour les instituts de statistiques et pour le personnel des ISN. Chercher à augmenter son salaire par des indemnités journalières financées par les bailleurs de fonds, par le biais d’une participation à des ateliers, une formation et des enquêtes sur le terrain, est chose courante. De ce fait, les systèmes statistiques manquent de stimulants pour améliorer les capacités nationales en matière de statistiques ou établir des priorités dans les éléments constitutifs des données nationales, repoussant ainsi à des années ultérieures la collecte de produits statistiques de base, tels que les données d’état civil et des registres fonciers. Même les données les plus exactes sont inutiles si elle ne sont pas accessibles aux gouvernements, aux décideurs politiques, à la société civile et à d’autres sous un format utilisable. De nombreux INS et autres services publiques hésitent à publier leurs données, manquent des capacités nécessaires pour publier et gérer les données selon les meilleures pratiques internationales, ou ne comprennent pas ce que désirent les utilisateurs de données et la manière de leur fournir ces informations. Ces problèmes sont graves car, pour améliorer ou éclairer les politiques et rendre les gouvernements et les bailleurs responsables de leurs engagements, il faut disposer d’une plus grande quantité de données ouvertes. La révolution des données en Afrique doit commencer par la résolution des problèmes de fond touchant à la production, l’analyse et l’utilisation des éléments constitutifs des systèmes statistiques nationaux. Ces changements doivent être entrepris et menés au sein des gouvernements, mais les bailleurs de fonds et les groupes de la société civile ont eux aussi un rôle majeur à jouer. La révolution des données doit contribuer à modifier les relations entre les bailleurs de fonds, les gouvernements et les producteurs de statistiques, et fonctionner en harmonie avec les priorités statistiques nationales. Les mesures recommandées suivantes répondent directement à un ou plusieurs des problèmes identifiés dans ce document. Collectivement, elles peuvent aider à établir une base solide sur laquelle une véritable révolution des données peut être menée de manière durable dans la région. Réduire la dépendance envers les bailleurs de fonds et allouer davantage de fonds aux INS dans les budgets nationaux. Les gouvernements africains devraient augmenter le financement octroyé à leurs INS et aux systèmes statistiques de manière à affecter de façon régulière les dépenses, maintenir les équipes et renforcer l’indépendance. L’idéal serait que les gouvernements allouent une part importante du financement nécessaire, sauf exigence budgétaire ou autre besoin inhabituel pour une année donnée. Si des mécanismes plus créatifs s’avéraient nécessaires, les gouvernements pourraient envisager que l’affectation régulière d’une partie des dépenses sectorielles soit liée à des activités pour la mise en œuvre de stratégies nationales pour le développement des statistiques – 1 pour cent pour les données, par exemple, ou un « supplément pour les données » qui serait ajouté aux projets de bailleurs de fonds pour financer les éléments constitutifs des données dans l’intérêt public. Mobiliser le financement des bailleurs de fonds au moyen de pactes entre le gouvernement et les bailleurs et expérimenter des accords de rémunération aux résultats. Les gouvernements devraient faire pression pour que les bailleurs de fonds financent davantage les systèmes statistiques nationaux, en recourant soit à une modalité de financement, soit à un pacte sur les données qui offre plus d’incitations à assurer le progrès et l’investissement dans des données de qualité. Un accord de rémunération aux résultats pourrait lier directement le financement aux progrès réalisés dans l’amélioration de la couverture, de l’exactitude et de la transparence des produits statistiques de base. Démontrer la valeur des éléments constitutifs des statistiques en parvenant à des accords de haut niveau entre les gouvernements nationaux et les bailleurs de fonds, pour donner priorité aux systèmes statistiques nationaux et aux principes visant à les soutenir. Les efforts à déployer peuvent également inclure un soutien accru à la société civile pour mieux souligner l’importance des statistiques nationales et tenir les décideurs politiques responsables des progrès accomplis. Renforcer l’autonomie fonctionnelle de sorte que les INS fonctionnent indépendamment des ministères sectoriels du gouvernement et bénéficient d’une indépendance accrue à l’égard des influences politiques. Ces efforts, ainsi que ceux déployés pour faire appliquer la législation déjà en vigueur, devraient être davantage soutenus par les programmes et initiatives existants à l’appui des capacités statistiques. Expérimenter de nouveaux modèles institutionnels, tels que les partenariats entre les secteurs public et privé ou la mutualisation du savoir (« crowdsourcing ») pour recueillir des données difficiles à obtenir ou externaliser des activités de collecte de données. Ces modèles permettraient d’accroître l’autonomie fonctionnelle et financière tout en conservant, sinon en renforçant, l’obligation de responsabilité des INS à l’égard des parties prenantes. Les partenariats public-privé dans les pays à revenu élevé ont démontré leur capacité à générer une demande et élargir l’accès aux données ouvertes. Même si 80 pour cent des pays africains ont procédé à un recensement au cours de la dernière décennie, l’Afrique investit encore insuffisamment dans les éléments constitutifs des données et, dans certains cas, les défis de l’économie politique ont pour effet de fausser les données. À l’avenir, les efforts devront être consacrés en priorité au financement et à l’assistance technique pour renforcer les attributs essentiels des éléments constitutifs des données. Mettre en place des mécanismes de contrôle de la qualité dans la collecte de données afin d’en améliorer l’exactitude. Il est possible de réduire bon nombre de problèmes dus à l’existence d’incitations divergentes en demandant aux INS d’assurer le soutien, la supervision et le contrôle de qualité sur les opérations de collecte et d’analyse de données effectuées par d’autres organismes d’État. Le cadre d’évaluation sectorielle de l’organisme Stats South Africa, par exemple, fournit des plans d’amélioration aux organismes publics et aux ministères qui produisent des données et évalue la qualité de celles-ci à l’aide d’un certain nombre d’indicateurs. Une meilleure utilisation des technologies pourrait aussi contribuer à régler ce problème. Encourager l’accès aux données ouvertes. Les gouvernements et les bailleurs de fonds devraient divulguer toutes les données publiables, non confidentielles, y compris les métadonnées, sous un format lisible sur un ordinateur et permettant une analyse. La Banque africaine de développement et la Banque mondiale devraient augmenter leurs prêts à l’appui du renforcement des capacités statistiques et pour stimuler les politiques d’ouverture des données publiques. Suivre les progrès réalisés et instaurer la responsabilité. Les organisations de la société civile, y compris les groupes de réflexion, ainsi que les organisations non gouvernementales devraient surveiller les progrès réalisés, à la fois par les bailleurs de fonds et les gouvernements en matière d’amélioration de la qualité des données et d’évaluation des écarts, et les tenir responsables des résultats. Le CGD est reconnaissant des contributions du Réseau Omidyar, du ministère britannique pour le Développement international et de la Fondation William and Flora Hewlett à l’appui de ce travail. Cette recherche a également pu être menée grâce au généreux financement de base apporté à l’APHRC par la Fondation William and Flora Hewlett et par l’Agence suédoise de développement international. Plus de 80 pour cent des pays d’Afrique ont procédé à un recensement entre 2005 et 2014, d’après les statistiques de l’ONU (http://bit.ly/UGezKV). Pour une évaluation du Réseau international d’enquêtes sur les ménages et du Programme statistique accéléré, voir Anne Thomson, Graham Eele et Felix Schmieding, Independent Evaluation of the International Household Survey Network (IHSN) and Accelerated Data Program (ADP) (Évaluation indépendante du Réseau international d’enquêtes sur les ménages et du Programme statistique accéléré), (Oxford : Oxford Policy Management, 2013), http://bit.ly/1nzzpDT. Shanta Devarajan, « Africa’s Statistical Tragedy » (Tragédie statistique africaine), Africa Can End Poverty Blog (Blog intitulé L’Afrique peut mettre fin à la pauvreté), 6 octobre 2011, http://bit.ly/1pxSR5g. Ces 12 pays sont l’Angola, le Burkina Faso, le Cap-Vert, le Tchad, l’Égypte, l’Éthiopie, le Liberia, l’Ȋle Maurice, le Mozambique, le Rwanda, la Tanzanie et l’Ouganda. Morten Jerven, Poor Numbers: How We Are Misled by African Development Statistics and What to Do about It (Mauvais chiffres : comment nous sommes induits en erreur par les statistiques sur le développement africain et ce qu’il faut faire) (Ithaca, NY : Cornell University Press, 2013). Lynn Woolfrey, Leveraging Data in African Countries: Curating Government Microdata for Research (Exploitation des données dans les pays africains : disséquer les microdonnées des gouvernements pour la recherche), DataFirst Technical Paper 22, University of Cape Town, 2013, http://bit.ly/1iBMMWx. Joel Gurin, Report from London’s Open Data Institute (Rapport de l’Institut des données ouvertes de Londres), OpenData Now (blogue intitulé Données ouvertes maintenant), 26 juillet 2013, http://bit.ly/1yJDcWF. Pali Lehohla, South African Statistical Quality Assessment Framework (SASQAF) Operational Standards and Guidelines (Normes et directives opérationnelles du cadre d’évaluation de la qualité des statistiques en Afrique du Sud) (Pretoria, South Africa : Statistics South Africa, 2010). http://bit.ly/1rubPLc.